He was originally purchased to become a police dog. (My husband is an officer) After a lot of training, he was used on two different calls. When he was called on his third, I wouldn't allow it. It was a dangerous situation for him. He has been retired since. I was told not to get attached to him,,,,YEA RIGHT! It has taken him a long time to become UNtrained. He now loves women and children, but still is very watchful of men. He definitely loves his family because he is very protective of us. My husband sometimes works late or has another job where he is away on some weekends. So I am never afraid to be at home alone. One thing I have noticed about him, and I don't know if it is the German Shepherd breed, or just him and his training, but, he really dislikes other animals. We have had quite a time with him being aggressive to other animals. We actually have to leave him in the car at the vets and she comes out to check him and give him his shots. This isn't a real problem because he’s not around other animals too much but when its necessary, like the vet's it can be a pain. He has been a wonderful dog and a good friend. I would recommend this dog breed to anyone who lives alone. They make great companions. 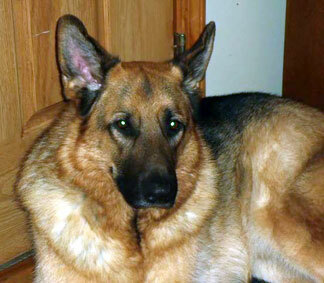 Sieben is black and tan, my daughter had a gray one. He was really pretty but the old popular color of black and tan is my favorite.